The inherent nature of wind flowing through your hair, pedals turning over and over, those first "by myself" moments as you ride on your own. A scraped knee, a big hug, ripped up cuffs on your jeans from pushing pedals all day; it's all part of the territory when you have a Schwinn beneath you. Our time in Austin, TX working with Schwinn Bicycles was a slice of moments we all remember as kids and carry with us into adulthood. The freedom, friendships, and two wheeled experiences that last a lifetime are what it's all about. We had a great time setting up scenarios and letting our talent be themselves on their bikes while capturing incredibly visual moments. 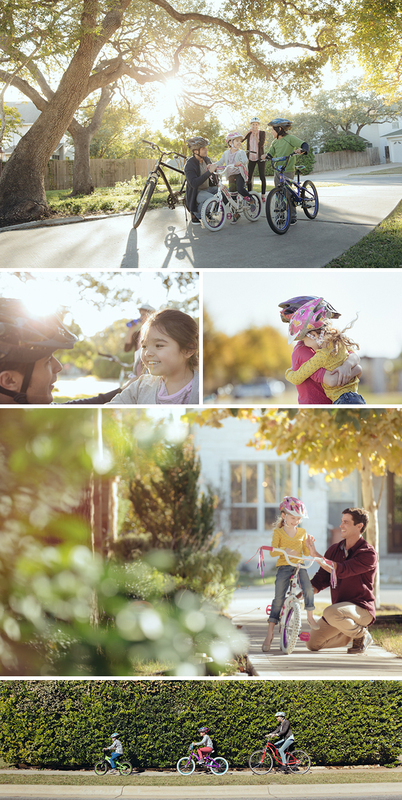 Making memories is what Schwinn is all about and we certainly did just that.